Chinese online fruit retailer, FruitDay, have built a strong promotional presence for Tasmanian Tiger Fuji apples on their website and have indicated that sales of the exclusive apples have started strongly. Tasmanian Tiger Fuji apples as presented on the FruitDay website (Source: http://www.fruitday.com/). FruitDay’s website promotes the Tasmanian Tiger Fuji apples as being sweetened by the Australian sunshine and full of vitamins and minerals. 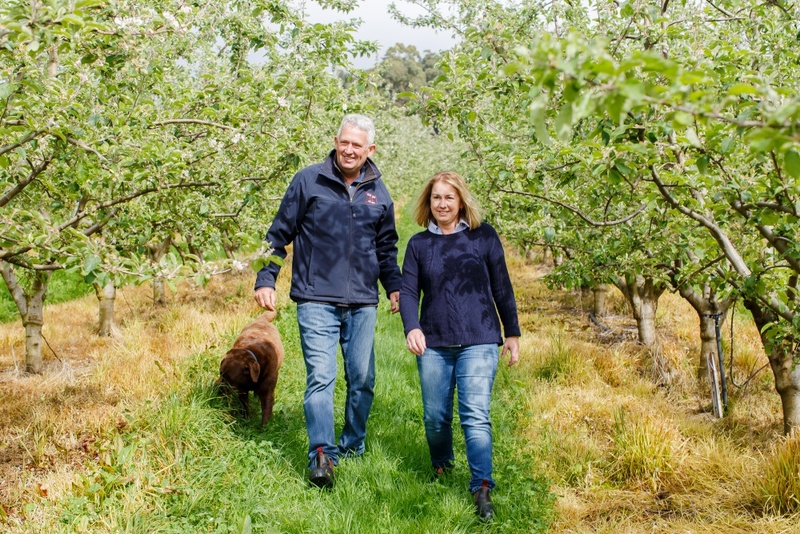 Andrew and Leeanne Scott of Scott Brothers, who produce the apples, are showcased as sixth generation growers. As is Tasmania for its abundant sun and rain, and island status – surrounded by oceans. Last year, FruitDay’s co-founder Loren Zhao visited Scott Brothers’ orchard to see the Tasmanian Tiger Fuji apples that FruitDay purchases via Hansen Orchards. Hansen Orchards have been supplying FruitDay with apples for three seasons, starting in April 2014 when they the sent the first shipment of Royal Gala apples to mainland China. Hansen Orchards’ outstanding commitment to exporting quality apples was recognised recently when they won APAL’s 2016 Exporter of the Year Award. Baden adds that other importers say that the eating quality of Tasmanian Tiger Fuji apples helps to separate them from other Fuji apples available in their markets. “FruitDay is very happy and proud to work with Scott Brothers and Hansen Orchards together to introduce the Tasmanian Tiger Fuji to China’s costumers,” says Loren. “To FruitDay customers this is not just a normal Fuji apple. The taste is very sweet and suitable for the Asian taste. Andrew Scott and Loren Zhao at Scott Brothers’ orchard, Tasmania, 2015. APAL has previously reported on Andrew and Leeanne’s Tasmanian Tiger Fuji apples, but FruitDay’s presentation of the Tasmanian Tiger Fuji apples was recently noticed by APAL’s Market Development Manager Olivia Tait for its outstanding promotion of the provenance, grower and the apple itself. “Understanding the origin of the product is very important for discerning Chinese consumers who are keen to learn not only about the environment from where their apples are sourced but also about the growers themselves, particularly when a family business is involved,” says Olivia. International buyers interested in Tasmanian Tiger Fujis may contact Baden Ribbon on baden@hansenorchards.com.au. Andrew and Leeanne Scott in their apple orchard in Tasmania.